Following on the heels of a stellar summer season, Del Mar Thoroughbred Club completed its fifth fall meet Sunday, highlighted by gains in total handle and four weeks of safe racing. All sources wagering for the 16-day session registered $165,289,183, compared to the 2017 total handle of $154,069,710, an increase of 7.3%. Del Mar’s 2018 fall racing festival had several standout performances, including a smart victory in the Grade I Hollywood Derby by Peter Brandt’s Raging Bull on closing Saturday, then an equally impressive triumph by Sol Kumin, Michael Caruso and Robert LaPenta’s Uni the next day in the Grade I Matriarch. Both of those eastern-based horses are trained by the country’s top conditioner, Chad Brown, and both were ridden by former three-time Del Mar riding champion Joel Rosario. Trainer Peter Miller continued his hot run at Del Mar by winning his fourth fall conditioning crown with 15 victories, while jockey Drayden Van Dyke captured his first fall title with 17 firsts. The pair had swept the 2018 summer honors previously with 31 scores for Miller and 42 for Van Dyke during the 36-day stand. 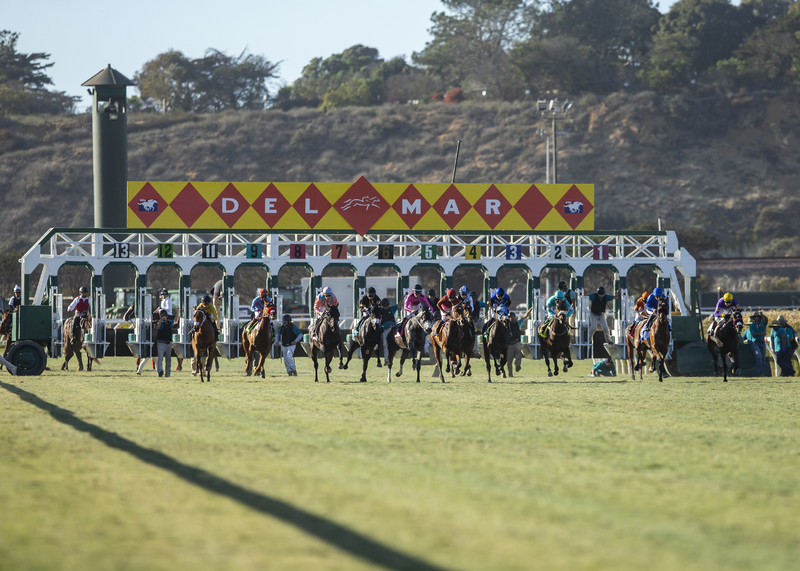 Del Mar will resume racing on Wednesday, July 17 for its showcase summer season, the 80th in its long and popular seaside run.